Walk, drive or bike down the street of any major city and you will see road signs and traffic signs posted everywhere. From the hard to miss red stop signs to the yellow pedestrian crossing signs, it seems like everywhere you look there is a sign telling you not to do this or not to do that. Unfortunately, in some situations, such familiarity can breed complacence. That is, such road safety signs become so much a part of the urban tapestry that drivers and cyclists stop noticing and heeding them. 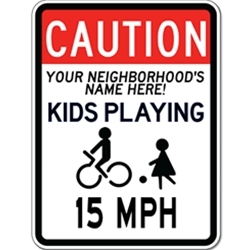 Getting the attention of drivers and then getting them to slow down and look for cyclists, children at play, pedestrians and more poses its own set of problems. With a little creativity and resourcefulness, some community members and businesses have tried their own hand at creating custom traffic signs and road safety signs. Rather than the familiar red and diamond-shaped yellow signs most of us are familiar with, these folks have taken it upon themselves to create marker-board road safety signs in the hopes that the off-beat nature of such signs will capture the ever-elusive attention of busy drivers. By adding some humor or lightness to standard-message “No Parking” or “Slow Down” signs, motorists may be both more likely to notice and heed them.